You can't miss the 17 foot marlin dangling on the corner of Garnet and Kendall as you cross into the heart of Pacific Beach. 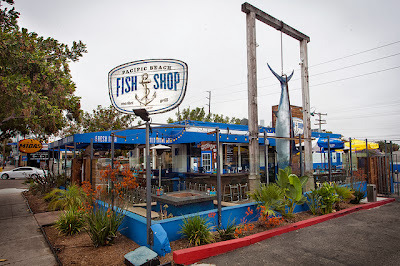 Since 2010, PB Fish Shop made a reputation for itself by offering the freshest catch from its laid-back and inviting location. Offering an al fresco bar alongside a large, glass-encased outdoor seating area and embracing an approach that encourages meal customization, the "Fish Shop" has become a local favorite due to its simple access to delicious seafood...and local craft beer, of course. We've been recommended to the Pacific Beach Fish Shop almost as many times as we've driven past it. Living in PB, we're very familiar with the eateries' acclaim for offering high quality seafood, reportedly receiving fresh seafood shipments daily. Although we hadn't visited for a sit down meal, we've sampled various offerings at local 'Taste-of' events and have always been impressed. Like most fresh 'fish shops,' PB Fish Shop isn't cheap, but they're certainly more reasonable than many, especially in light of the fact that you can mitigate the damage done by bringing in your own favorite bottle of wine absent any corkage fee. Combine BYOW with their $1 oysters on Thursday nights and you've got yourself an unbeatable deal - and quite the rowdy scene from what we've heard. 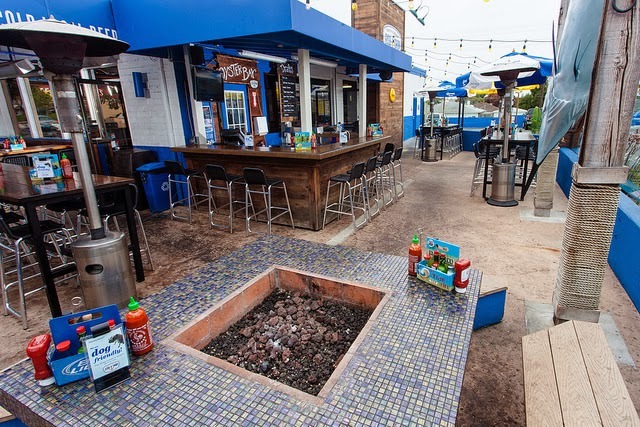 Being dog and kid friendly (one in the same if you ask us) is another draw, especially in Pacific Beach where many establishments are 21 and over. We nestled in, cozied up to the outdoor firepit table and grabbed a couple brews from their impressive list of local crafts (beer and wine only). A Societe Brewing The Harlot and an Ironfire Brewery 51/50 Double IPA eased us into the evening as we perused the menu (copied below). 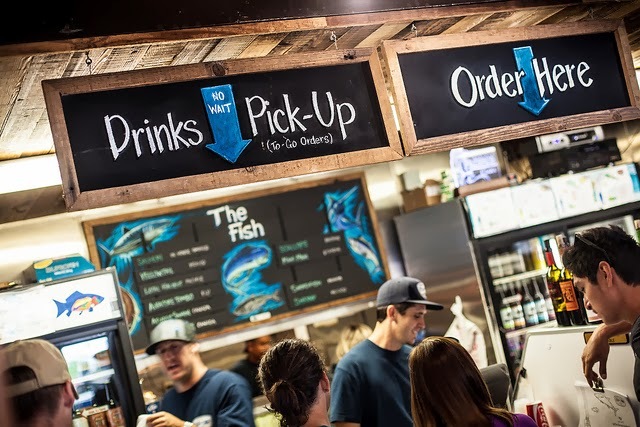 PB Fish Shop offers counter service where customers can customize their creations. Check out the fresh catch on display (which is also available for take out) and pick your seafood. Choose to have it grilled or fried, then choose your marinade and your vessel (how you'd like it prepared, whether it be a salad, taco, sandwich or plate). There is also a list of predesigned dishes and sides for those desiring a more guided experience. We began with an order of the lobster lumpia (4 for $9.50). Akin to spring rolls, this traditional Southeast Asian dish is stuffed with bits of Indonesian slip lobster, cabbage and sweet potato, crisped to perfection and served with a side of beautifully cooked, fluffy Jasmine rice and a flavorful sweet chili dipping sauce, which we used to douse the entire plate. I could have scarfed down a baker's dozen! To test the lauded fish selection, we ordered the sashimi of the day ($10) - a plate of Fiji ahi tuna served with a bright emerald green seaweed salad. The fish was cut beautifully and melted in our mouths like butter, definitely showcasing its true flavors, a testament to its freshness. So fresh and soo clean! The Fish Shop shrimp ($9.50) is likely the most popular dish on the menu - shrimp seasoned in house seasoning, sauteed 'til crisp, caramelized in brown sugar and served with a spicy chipotle aioli dipping sauce. The mix of sweet, savory and salty on these delicious white shrimp was addicting, and a perfect accompaniment to a refreshing Ballast Point Sculpin IPA, which served honorably as beer #2. As the sun set and the ocean chill swept up Garnet we battled the cool 'winter' evening with a cup of hot clam chowder ($4 for a cup). Prepared New England style, this soup was hearty with meaty pieces of clam, chunks of potato, and a light and tasty broth that didn't leave you feeling like you just indulged in a cup of heavy cream. 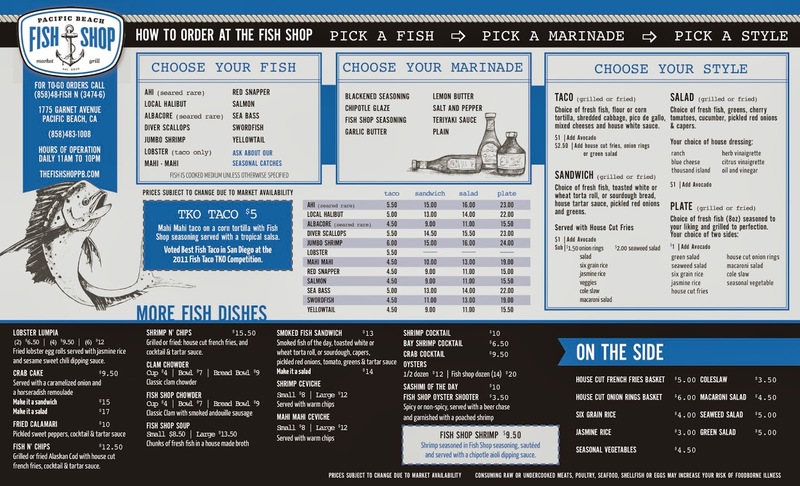 The Fish Shop also offers a version with smoked andouille sausage for added depth and substance, as well as a bread bowl option. Hankering for some fried food, we opted to preserve the integrity of all our seafood orders and instead chose a basket of house cut onion rings ($6), which were very satisfying. The batter was light, the onion didn't pull out, and dipped in the 'chowda', these bad boys were blissful! We knew we had a winner when the mountainous TKO Taco arrived ($5). Grilled mahi mahi is marinated in Fish Shop seasoning, topped with mixed cabbage slaw, and finished with shredded cheese, a house made tropical mango salsa and a half avocado. It wasn't easy to take the first bite of this Goliath, but we squeezed lime to activate, and once that bridge was crossed, we enjoyed the counterbalance of textures and flavors that all came together for a delicious fish taco, which just so happens to have won The Fish Shop first place in 2011's TKO Fish Taco Challenge. The Fish Shop serves desserts on Friday and Saturday nights when nearby bakery - Sugar & Scribe - visits to offer patrons a mixed selection of adorable and delectable desserts. We couldn't resist a bite sized cupcake for each of us: one carrot cake and the other German chocolate cake. An ideal end to a very tasty meal, and you know how we just love locals supporting locals! PB Fish Shop will soon replicate its recipe for success with the opening of two new 'Fish Shop' locations in Encinitas and Hermosa Beach. Be sure to stop in and let us know what you think, and visit on Thursday evenings for the oh-so popular $1 oyster night! For more information, visit the Pacific Beach Fish Shop online and follow on Facebook and Twitter.